When I saw this article on Intel Vaunt, I started to think about the ways smart glasses could change the way we interact with the world around us. 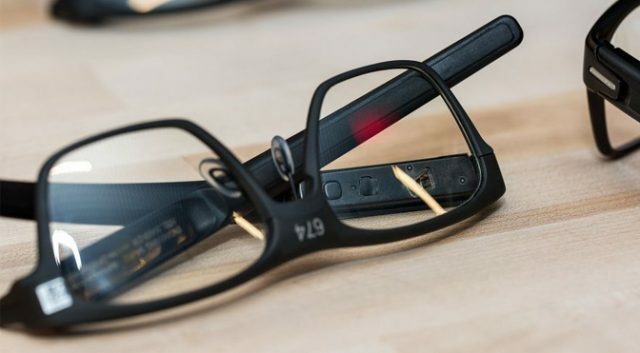 Smart Glasses with a secure connection to the internet could revolutionize the way we interact with people, the way we manage data, and what we expect from technology. Imagine you are a new employee in the Sales organization and every employee in the organization has a set of these glasses issued by the company and running their software. Your boss asked you run some ideas by the Samples Coordinator for your product line. You are new and have no idea who this person is. You look down and blink at the menu to find Janet Smith is the Samples Coordinator you are looking for. An image of her pops up and you see her location. She is working on the next floor up in a shared work space. You blink on the navigation icon follow the arrow to her location. There is a long row of computers and chairs with people working at them. You walk up to the first blonde woman you see and blink to select, “who is this”. You see this is Jane Thomas and she works in Product Marketing. You see the next blonde woman two seats down and find it is Janet Smith. With this super simple example, you get the idea that this technology could do things you can do on your cell phone today. Now image you are working in a gas or chemical pad near a factory. There are 25 large tanks and hundreds of gas cylinders. Some of these are poisonous or acidic, so this is a dangerous place to work. What if these same glasses recognized where I was when on company property. As I move walk down the walkway between these tanks and cylinders I can see on my glasses 1) How full the tanks are 2) What is in them 3) instructions on the proper way to open a tank or attach a cylinder. Safety information, status information, and “how to” instructions are all available at the blink of an eye. I could report a leak, take a picture, or stream a video without needing a tablet or laptop. If I had to repair a valve, I could just bring my tools. I wouldn’t need lots of documents, drawings, or pages of instructions. I could stream everything I am doing to a co-worker to get expert advice or call center to monitor me and send help if something goes wrong. Now imaging you’re an architect going to a job site to make some final changes. Your drawings need to match what was built and the crew on site had to make some changes. Instead of bringing stacks of drawings and looking for changes, you could walk through the job site. Everything you see is translated and mapped against the latest drawings. You get a warning symbol at the location where things don’t match, so you blink click to bring up the drawings and start comparing the details. I know these examples need some server and software infrastructure behind them, but there is nothing in these examples I couldn’t do today if I had the glasses and the right APIs. There are hundreds of business examples that could be built today for security, collaboration, manufacturing, maintenance, logistics, and so much more. I know Intel has cancelled the Vaunt project, but that doesn’t mean the idea isn’t viable. Intel had a mobile phone in the 1999 or 2000. If you’d like to see this in action, check out the first few chapters of the new book I am working on, Earth’s Zero Hour. Who knows?! These glasses could be standard issue for all kinds of companies, from micr-micro chips. Fabric designers to rocket engineers! This would make research, data analytics to the whos- who… could, would be remarkable!